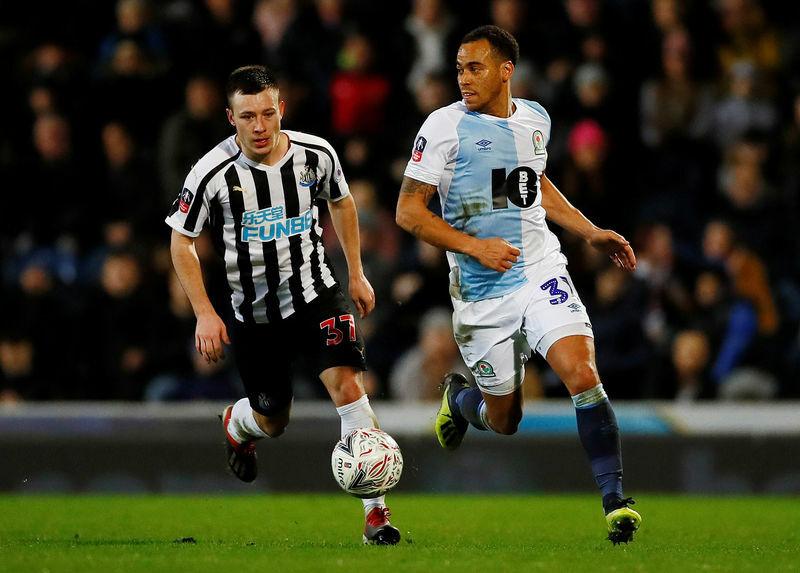 Newcastle United beat Blackburn Rovers 4-2 after extra time while Championship side StokeCity threw away a two-goal lead as they suffered a shock 3-2 home defeat by third-tier ShrewsburyTown in FA Cup third-round replays on Tuesday. Newcastle fans, who had seen their side narrowly escape defeat in the home match with Championship Blackburn, were given some respite from their top-flight struggles with a replay win against their fellow six-time FA Cup winners at Ewood Park. Rafa Benitez's much-changed side with a youthful streak had looked set to coast through when Sean Longstaff's deflected shot put them ahead after 56 seconds and Callum Roberts volleyed home a second four years since his only other Newcastle appearance. But Blackburn hit back through Adam Armstrong, a former Newcastle player and lifelong fan of the Magpies, and Darragh Lenihan's header before halftime. When the tie went into extra time at 2-2, Bradley Dack missed a great chance to put Blackburn ahead before goals from Joselu, who should have been ruled offside, and Ayoze Perez earned Newcastle a home tie with fellow top-flight side Watford. Benitez praised his team's commitment but was left counting the cost of the victory with defenders Ciaran Clark and Jamaal Lascelles suffering injuries. Tyrese Campbell, son of former Everton striker Kevin, scored twice in the first half for second-tier Stoke but three goals in the last 20 minutes for the Shrews served up another surprise. James Bolton's 20-metre strike began the fightback in the 71st minute before a penalty from Fejiri Okenabirhie and an 81st minute shot from Josh Laurent completed the fightback. It earned Shrewsbury a glamour fourth round home tie with their neighbours, Premier League Wolverhampton Wanderers. In Tuesday's other replay, struggling Championship team Sheffield Wednesday came through another tough test at in-form third-tier side Luton Town, winning 1-0 with an Atdhe Nuhiu goal straight after the interval. The Owls' reward is a fourth round trip to Premier League Chelsea.